Attach a long bar to the lat pulldown machine, and adjust the thigh pads so that when you are sitting your knees are at right angles and feet flat on the ground. Grasp the bar using a wide grip and sit down maintaining the upper body in an upright position, slightly leaning back from the hips. Pull the bar in front of your face to the top of your chest and pause. 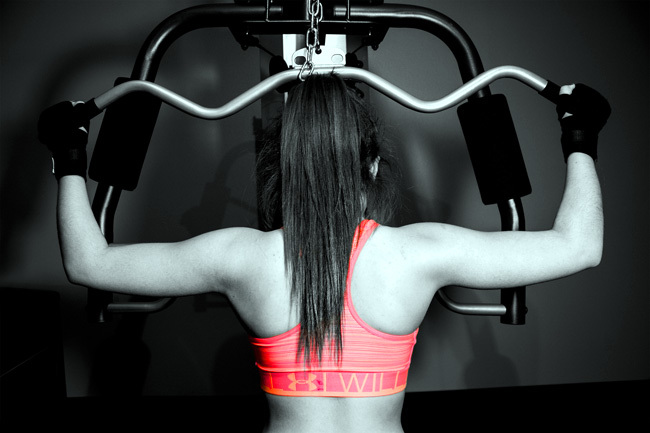 Slowly release the bar back to the starting position by straightening your arms. keep shoulders down to stabilize the scapula and isolate the lats. The grip can be either facing forward or facing back to you. Each grip will use the muscles differently. Avoid the potentially dangerous behind the neck technique alternative. See exercises to avoid. read the article on Lat Pull-downs: One Simple Movement Can Double the Effectiveness of Pull-downs.